Voters in Trinidad and Tobago will decide tomorrow whether to give the United National Congress (UNC) a clear mandate to govern the twin-island republic for the next five years, or chose the opposition People’s National Movement (PNM) to run the country’s affairs. 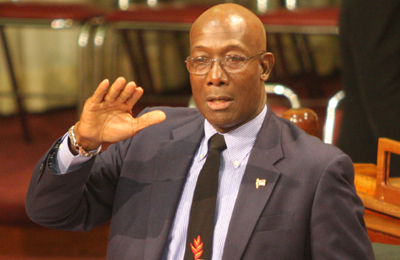 The UNC, led by Prime Minister Kamla Persad-Bissessar, is the main party within the incumbent People’s Partnership coalition and is facing a strong challenge from the PNM, led by Dr Keith Rowley in a race that pollsters say is too close to call. Both parties have been wooing the country’s voters in the run-up to the polls in the hope of winning the majority of the 41 seats in Parliament. Polling stations open tomorrow from 6:00 a.m. to 6:00 p.m.
A CARICOM electoral observer mission, led by Jamaica’s Director of Elections, Orette Fisher, is in Port of Spain to monitor the proceedings. He is assisted by the Chief Elections Officer of Belize, Josephine Tamai. According to the CARICOM Secretariat, other members of the mission include experts in electoral management from Barbados, the Bahamas, Grenada, Guyana, Jamaica, St Lucia, St Vincent and the Grenadines and Suriname. The mission is accompanied by a two-member support team from the CARICOM Secretariat. I find it most interesting that despite the charges of corruption, mismanagement etc.etc. which followed the Govt that the race is supposedly too close to call – doesn’t say much for the opposition. Hail, hail the China parade…. What does this election in T&T means to Barbados, this is where our politicians has taken us.so much depends on the outcome. Who ever wins the election in TnT it will mean nothing in Bim.Things WILL remain the SAME for those TnT businesses here.